"Guero" translates to "blonde" in Spanish; these peppers pack about as much heat as a jalopeno but are more floral in flavor. Who doesn't love a blonde? 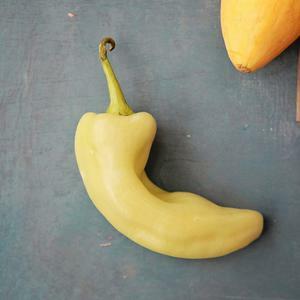 "Guero" translates to "blonde" in Spanish, and while always yelow, pale gold, or straw-colored in color, the specific pepper deemed a "Guero Chile" varies from region to region. The Caribe and Caloro chiles are both considered Guero among a long list of others. Gueros are similar in heat to a ripe jalapeno. This chile pepper is more floral-flavored than a jalapeno, however, and is typically 2-3 times the size. Like other spicy chiles, most of a Guero Chile's heat is in the white membranes holding the seeds. Peppers of any sort are strong sources of folic acid, fiber, potassium, and Vitamins A and C, and Guero chiles are no different.